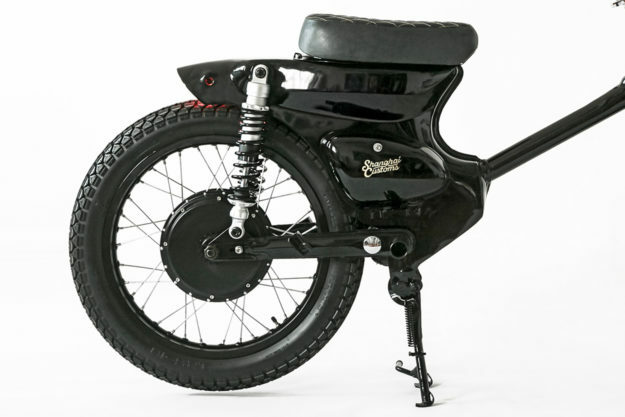 With a population of 1.4 billion, China should be a goldmine for bike builders. But it’s not: motorcycles are banned in many of the biggest cities. In Shanghai you can still get a license plate for a bike, if you have 450,000 Renminbi (Yuan) to hand. Which is about US$67,500. 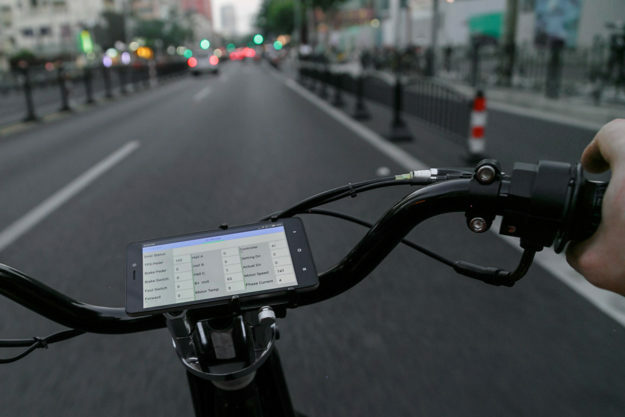 On the other hand, you can get a license for an electric bike for about 50 RMB, which is $7.50. 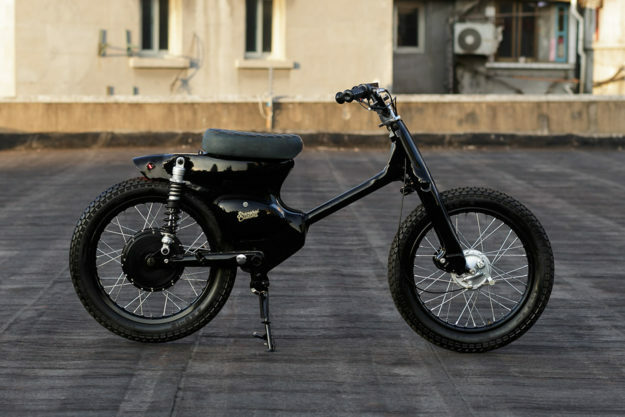 China is tackling pollution by shifting the market towards electric motorcycles, and the small number of local custom builders are adapting fast. Shanghai Customs is one of those builders. 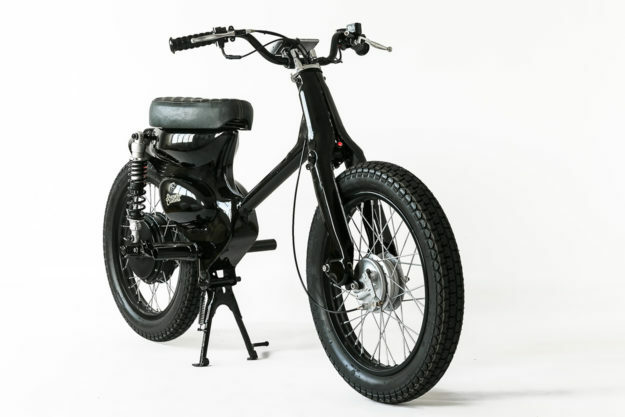 We’ve already shown their stylish electric street tracker, but shop boss Matthew Waddick reckons it’s this new eCub that will soon become his biggest ever seller. 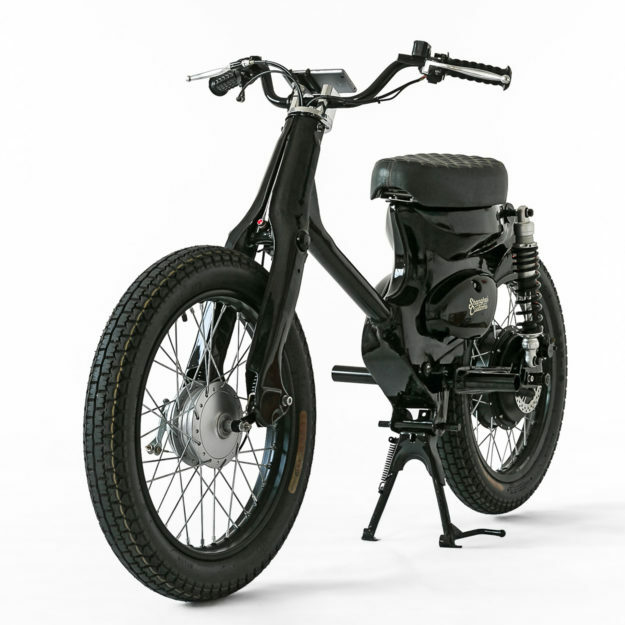 If you’re attracted to minimalism and timeless design, you probably appreciate the elegant simplicity of the Cub frame. 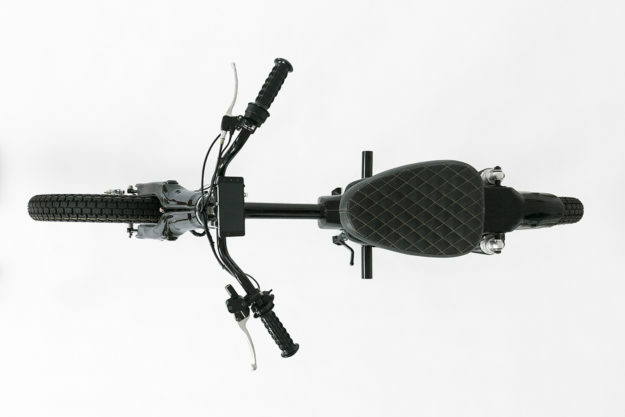 Its size lends itself well to an electric scooter conversion. Matthew started by welding a cover over the part of the frame where the engine used to be. He’s also made mounts and fixtures to secure the stainless steel box that holds the battery pack and battery management system. 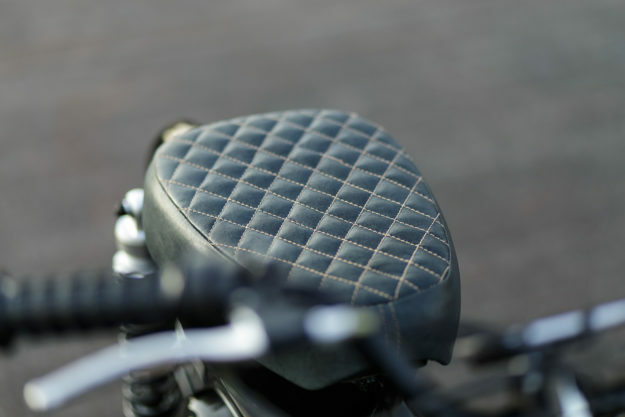 But he’s left the holders for the rear foot pegs in place, because the eCub comes with a dual-seat option for riding pillion. 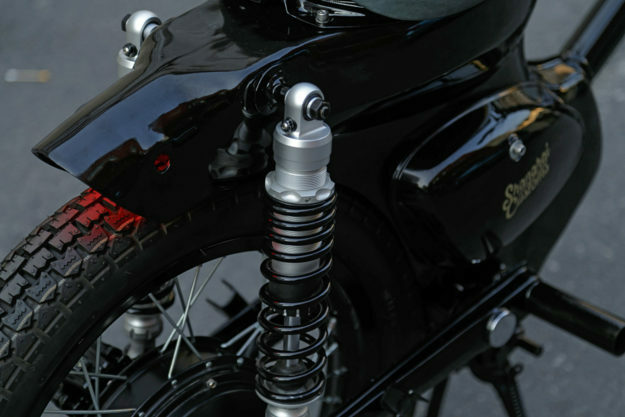 “I modified the swing arm to accept the electric motor, and then laced it onto an 18-inch gloss black aluminum rim,” he explains. The chunky-looking 3.25×18 tires are from one of the better Chinese tire brands, CST. The adjustable suspension, in brushed aluminum and black, was custom made by a suspension specialist 200 miles away in Zhe Jiang. 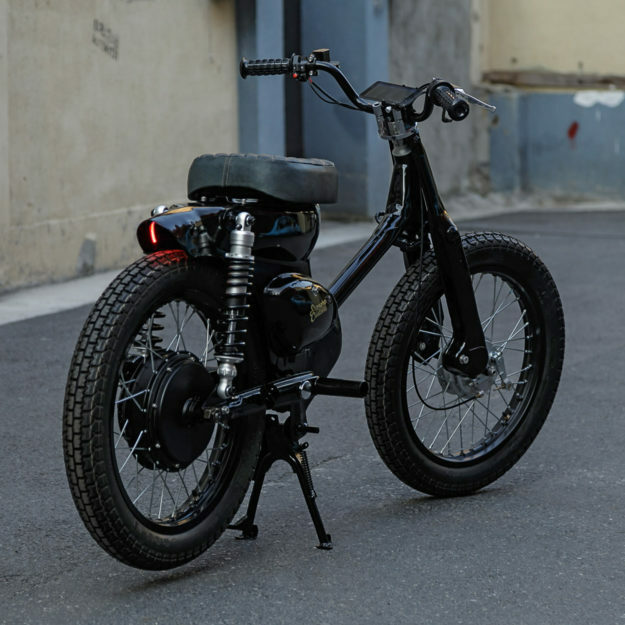 Control comes from a 3-wire motorcycle-style throttle: “It gives a nice snapping carburetor effect,” says Matthew. 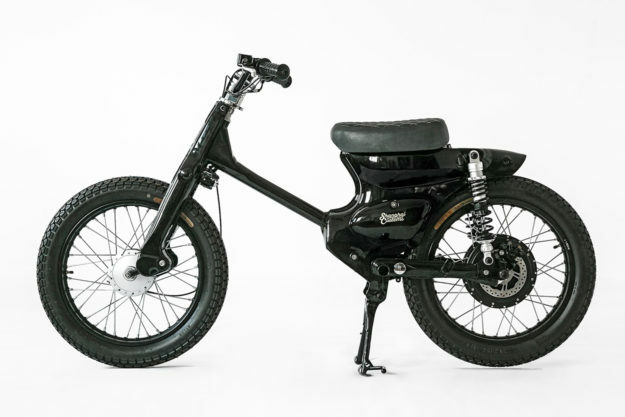 But the real achievement is hiding all the wiring that comes with a fully electric bike, not to mention the battery pack. Power comes from Panasonic Sanyo Li-ion cells in a 1.2 kW pack, wired up to a 2000 W hub motor. Three heavy-duty phase wires head into the controller. Other than a tiny bit of grease on the steering head bearings and front drum brake, there are absolutely no fluids of any kind on this Cub. There are still tweaks to be done. 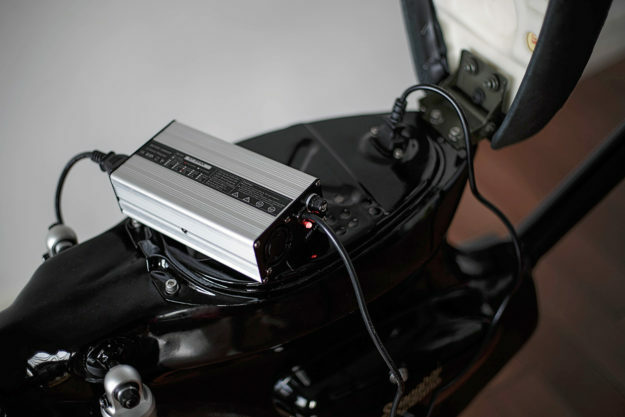 The motor is a little too big for the battery pack, so the controller limits the current to 35%. 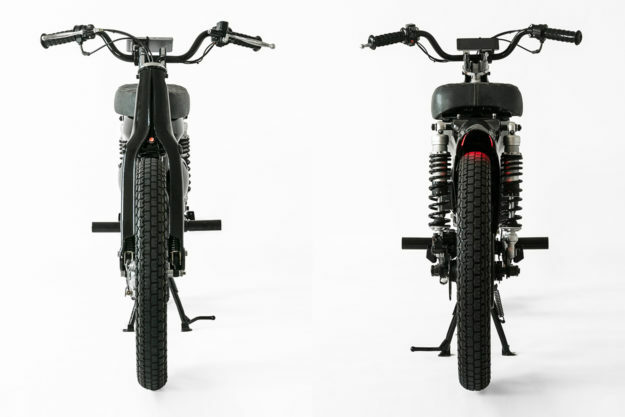 Much as we love the sound and smell of conventional bikes, it’s good to see custom builders testing the waters in this way—and the tide is undoubtedly going the way of electric at the moment. Electric power is already creeping into classic car world: how long is it going to be before the same happens to the custom moto world? We can’t wait to see what happens.